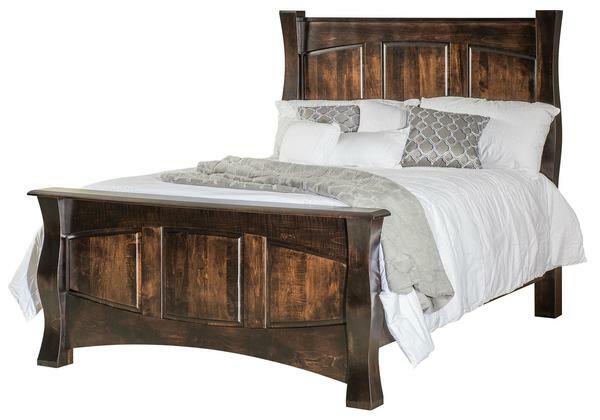 Magnify your bedroom suite with our Amish Reno Panel Bed. This handsome rustic style bed looks best in a rustic inspired bedroom, but can also go well with a mid century modern or contemporary style bedroom. In the picture, this bed is shown in brown maple wood. Get this Amish bed in brown maple wood or one of our 15 other premium hardwoods available. Once your wood is selected, you are ready to choose a finish color. It is best to choose a finish color that pairs well with the wood type. For instance, oak is a good choice when wanting a lighter color and heavier look. If you want your bed to look sophisticated, walnut wood is a great choice! If anything is unclear, please call one of our Amish Furniture Specialists today at our toll free number - 866-272-6773. Thank you for shopping with DutchCrafters Amish Furniture. Shown in Brown Maple with Briar stain.